Note: This update includes no major additions to content. This update focuses on improving usability and bug fixes. Added a quick grab option to the gameplay settings. 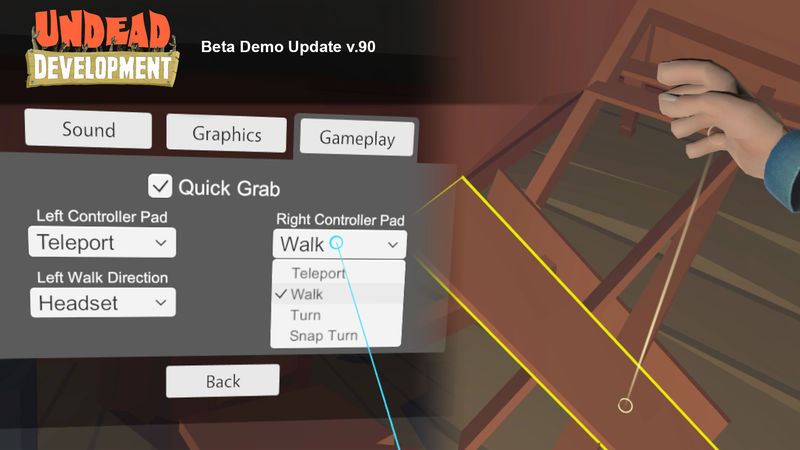 With quick grab on you can pickup objects under your hand from a distance. The nailing system has been improved. Nailing should feel more consistent. Objects can be further apart from eachother and still be nailed. Added a highlighting outline to objects the player is hovering over. Adjusted inventory belt settings to help prevent it getting in the way of looting objects. Belt now enters ghosting mode more frequently. Placing objects into the inventory is now based on the location of the controller instead of the collider of the held object. Ambient music now fades in and out more smoothly. A ghosted version of the player hand now shows up when a held object loses position with the controller. Controllers now vibrate when the player takes damage. Player hurt noise is now a bit louder. Fixed an issue where an item would fall through the ground and you would lose the use of one inventory slot. Fixed a bug that would cause a weapon to not be able to drop properly if dropped quickly during or after a teleport. A number of other minor bug fixes and adjustments. Please let me know if you encounter any new issues or if there is a particular issue that already exists that this patch doesn’t fix. Thanks everyone for the feedback and support. Ladrik i am VR Community Manager at http://www.gamersplatoon.com/ so if you dont mind can i put your game also on our website etc...or you want to wait till get game ends? Hey CrazyManOPS, feel free to share the game with your community! just make sure they are linked / downloading from the official sources. Thanks! Yes no problem,,and when will be on steam we will than go for real marketing, media etc...so you have our fully support.